Doodlebug, I love your name, it no doubt fits perfectly. Being a daddy's girl can be a very good thing. Doodlebug is very a special little dog. She is what you call a daddy's girl. She will sit at the door for at least a full minute when she knows Daddy is coming home. When he walks in, she will not stop whining until he gives her what she wants - and that is attention. She is one of a kind. Doodle is a petite six inches tall and weighs four pounds. 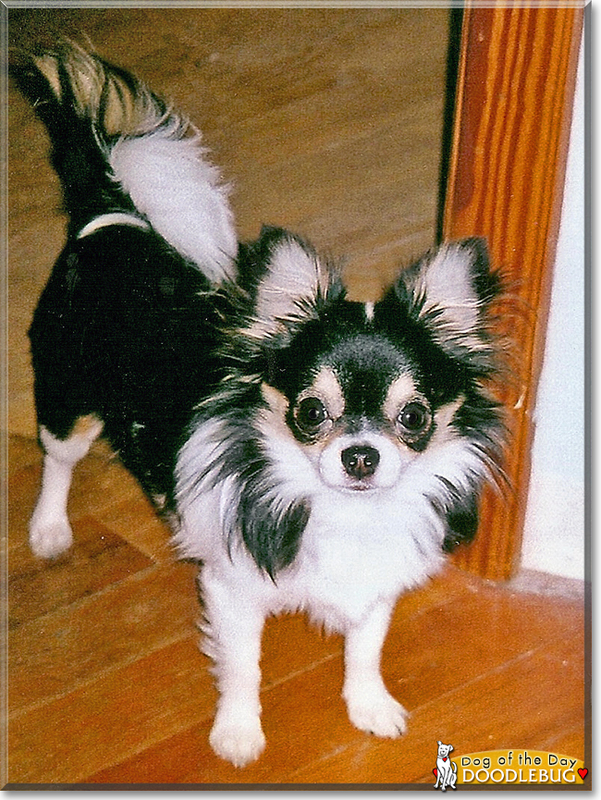 Some people think little Chi-chis are all little yappers and biters. Not this one. I take her to the nursing home with me in Fredericktown, and people love her. I firmly believe it is all a matter of training, some small dog owners seem to not bother! Routine is important to Doodlebug. When it comes to bedtime, she has to be on daddy giving him lots of kisses. Than she cuddles up to a good night's sleep. She is so loving and even does some contented sighing at the end of a day. There is no doubt in my mind where she will be if I need to find her. With her daddy. Hello, petite Doodlebug in Missouri! Happy Dog of the Day! What a fluffy girl you are- I like your full coat, which looks very soft! I smiled when I read about how you make nursing home visits; I imagine you must bring loads of smiles to the people you meet! Your best person is your daddy, though- he gives you attention and you respond with kisses at bedtime Perfect! Happy, happy Dog of the Day to very special Doodlebug! Greetings, Doodlebug! (LOVE your name, hehe) Happy Dog of the Day, sweet baby girl! What an adorable Chi baby you are, Doodlebug, just as precious as can be! Just look at that long, flooofy coat, those perky ears, those big, brown eyes! Heart-melting!!! How could anyone resist a pupper as precious as you, Doodlebug? (hint*hint*...not DADDY! ) Oh, nothing beats being a Daddy's girl! I know. I was one! You may be not much more than pocket sized, Doodlebug, a mere 6 inches high, weighing in at 4 lbs, but when it comes to personality and heart you're giant sized! Beautiful inside and out, just as special as can be, that you are! You even take time out of your busy day to bring some much needed comfort and smiles to those dear folks at the nursing home! How wonderful is that! How lucky your Daddy is, having a furkid, a loyal and loving best friend and devoted companion, an official end of the day greeter and bedtime snuggler in you! They just don't come any sweeter than you, Doodlebug! You're the best!, one in a million, and so very deserving of your big day of honor! Thanks for the BIG smiles, cutie pie! Meeting you today has been a real treat! Hope you're enjoying a very special Dog of the Day celebration, sweetheart...cuddling with your Daddy and Mommy, giving and receiving kisses; being loved and pampered to pieces, treated to all your heart desires and more...by your Daddy and Mommy! Lots of love, cuddles and kisses to you, precious Doodlebug, our very special and most deserving Dog of the Day, EVERY day! Dearest Doodlebug, you are absolutely precious! So adorable, with that fluffy, pretty-colored fur and that sweet, sweet face with those lovely huge eyes gazing right out at me. You have the most delightful personality, too! You love your Daddy dearly and wait each evening for him to come home to give you loads of affection. And you are so mellow and easy-going, you brighten the day of the nursing home residents you visit. For that matter, you clearly brighten the day of everyone you know and meet! You and Daddy and your other family members all love each other very much, don't you. What a wonderful love-filled home you share! Congratulations, darling Doodlebug, on being chosen today's Dog of the Day! We hope you and Daddy and all your family and friends are enjoying a fine celebration, full of fun and lovies and all your favorite games and treats. Congratulations on being Dog of the Day, Darling Doodlebug!